Home Energy Conservation Wind Solar, This is some of our Small Wind Turbine training video dealing with conservation tips. Since we train customers, dealers, and installers nationally, we have many training videos full of content like this. The support and training that we provide with a Small Wind Turbine is second to none. 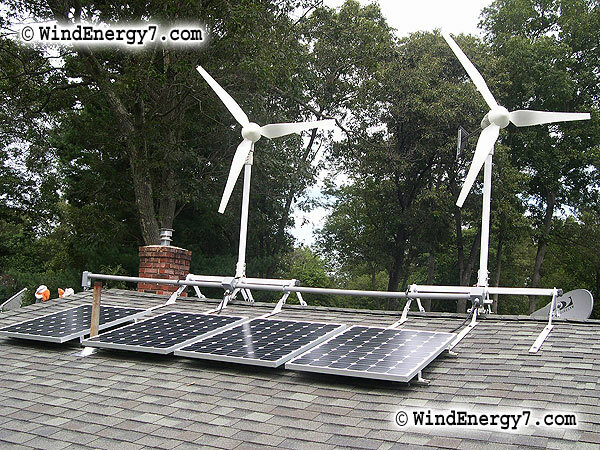 Our patented rooftop small wind turbine kits have hybrid wind/solar technology. We invented the only small wind turbine that’s safe and quiet for your home, certified to 130mph. 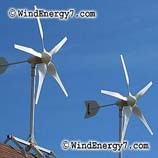 WindEnergy7 LLC is an Ohio based manufacturer of small wind turbine kits that are sold online. We hold patents for our inventions, small wind turbine kits that make rooftop wind possible. We have a growing dealer network of individuals in the US who use our products and an installed base stretching from Hawaii to Massachusetts. Many customers have found it easy to become customer/dealers with our wind turbine training. Like all our other innovations, we invented Small Wind Turbine training videos as well. Our Customers, Dealers, and Installers are regularly getting more and more training through our home wind/solar video training series. This Ohio small wind generator installer and dealer for WindEnergy7 has recently installed the most advanced small wind generator system in the US, the Home Wind Farm™. The hybrid system has a maximum power output of over 4kW. This Small Wind Generator system features redundant charging capability, integrated wind and solar hybrid generation, emergency battery backup for the home and more. The video here shows one of our most recent installations of our Home Wind Farm™ systems. The Home Wind Farm™ system is an exclusive innovation of WindEnergy7 LLC, an Ohio based manufacturer of small wind generators and solar electric products. The intelligent layout is by the WindEnergy7 dealer installer. This was part of the planning that optimizes the wind harvesting of the 3 generator Home Wind Farm™ system. Wind patterns are considered and the generators are located in the best possible place for wind harvesting. Featured in the video above, the RoofMill™ is a smaller roof mounted system that is a wind/solar hybrid energy system that puts out 4.0kW per system. 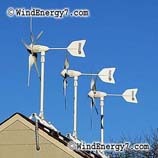 These Small Wind Generators sit atop a normal home or building. Customers can start with one or several. The Home Wind Farm concept allows a customer to step into this technology with a smaller investment and prove out their investment as they go. The modular generator array concept allows for easy bolt on expansion to a system. A customer can add more power at any time whether they are using the TowerMill™, or the roof mounted RoofMill™. WindEnergy7 pioneered the concept of multiple wind generator arrays as an innovation of the US manufacturer. Home Wind Farm™ was initially used with another WindEnergy7 innovation, the RoofMill™, an invention of mounting smaller small wind generators on a roof. The RoofMill™ won a green design contest on Earth Day 2010, an esteemed green design award. Whether you need a TowerMill™, or a RoofMill™, WindEnergy7 systems are all designed as integrated hybrid wind/solar power. This is another innovation of WindEnergy7 LLC system design. Our Jumbo Solar Panels upgrades shown below put out 197 watts per panel and add the reliability of solar charging to the systems. Our great big WindEnergy7 high output polycrystalline solar panels are working in tandem making our system much more consistent and reliable at delivering energy every day. In cases of low wind your solar power will continue to deliver energy. Compared to a home solar only system, our wind generators make power at night, on cloudy days, and when there’s heavy overcast storms. We have 4way™ Emergency Power which is another hallmark that makes a WindEnergy7 system better than any competing home energy system. With our systems you have 4way™ Wind. Solar, Battery Bank, and Grid as sources for power when you need it and your home will have power with or without the utility company. Since this Home Wind Farm features redundant systems, this home even has power if a generator system were to get knocked out or fail, there are two complete systems that can each run without the other. To see more videos of our small wind generators, go to — WindEnergy7.Com — and you can find info about becoming an owner, installer, or dealer of our rooftop wind generator systems. There are still areas open for new dealers to become the local source for wind/solar systems. So, if you are interested in becoming a small wind generator dealer fill out the Contact Form at — WindEnergy7.com — and we can see if your area may still be open for you to become the small wind generator dealer for your surrounding county territory. You can buy a system online and we ship by UPS. You may become a dealer and or installer if you like, just fill out the Contact Form and let us know what we can do to help you. ONLY AVAILABLE FROM: WindEnergy7-Com – WindEnergy7 LLC, The Home Wind Turbine manufacturers, located in Ohio, have an opportunity for people to get a system and become the local home wind turbine dealer in their local community. WindEnergy7 has a dealer and installer network in more than 30 states all across the US. We invented the home wind turbine kit and specialize in complete systems with outstanding technical support and installer training. Helping homeowners build and install wind/solar hybrid systems is a really fun way to make a living. We have kits starting at just $2990 and going up to whatever size project a customer needs. We even sell larger community sized wind turbines for school districts or local government projects. Anyway, the best selling is the smaller rooftop mounted turbines that connect with a solar panel to give clean reliable power. Congress passed legislation, the Emergency Economic Stabilization Act of 2008, H.R. 1424, that includes a new federal-level investment tax credit to help consumers purchase small wind turbines for home, farm, or business use. President Bush is expected to sign the bill into law. Owners of small wind systems with 100 kilowatts (kW) of capacity and less can receive a credit for 30% of the total installed cost of the system.. unlimited. The credit will be available for equipment installed from the date the president signs the bill through December 31, 2016. For turbines used for homes, the credit is covering complete installed cost of hardware, wiring, labor, etc. You may be able to take a credit of 30% of your costs of qualified solar electric property, solar water heating property, small wind energy property, geothermal heat pump property, and fuel cell property. This includes labor costs properly allocable to the onsite preparation, assembly, or original installation of the property and for piping or wiring to interconnect such property to the home. Qualified small wind energy property costs. Qualified small wind energy property costs are costs for property that uses a wind turbine to generate electricity for use in connection with your home located in the United States. The home does not have to be your main home. Qualified solar electric property costs. Qualified solar electric property costs are costs for property that uses solar energy to generate electricity for use in your home located in the United States. This includes costs relating to a solar panel or other property installed as a roof or a portion of a roof. The home does not have to be your main home. Qualified solar water heating property costs. Qualified solar water heating property costs are costs for property to heat water for use in your home located in the United States if at least half of the energy used by the solar water heating property for such purpose is derived from the sun. This includes costs relating to a solar panel or other property installed as a roof or a portion of a roof. To qualify for the credit, the property must be certified for performance by the nonprofit Solar Rating Certification Corporation or a comparable entity endorsed by the government of the state in which the property is installed. The home does not have to be your main home. Today WindEnergy7.com posted some pictures of the rooftop kits that were developed and built recently. You can check those out at their blog. 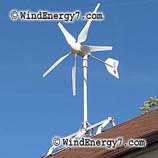 WindEnergy7.com has 1 size larger than this available in a rooftop kit but the size pictured is most popular kit. WindEnergy7.com is interested to help you with your wind/solar needs. If you are interested in becoming a local dealer for WindEnergy7 products, we are building that ground floor network now. “We thank Congress for recognizing and supporting small wind systems as an important contributor toward energy security and a cleaner environment. This credit will help individuals cut their electric bills while combating global warming in a tangible way,” says Ron Stimmel, Small-Wind Advocate with the American Wind Energy Association. This legislation marks the first federal incentive for small wind systems since 1985. Industry members say the credit could foster U.S. market growth of 40% or more annually. Our allies have advocated for a 30% federal investment tax credit for small wind systems 100 kW and smaller to put the industry on equal policy footing with the solar photovoltaic (PV) industry. The two technologies share the same market. The broad legislation passed also extends and expands a similar credit for the solar industry that was first passed in 2005. Residential and commercial solar PV installations can receive a 30% credit for residential applications and uncapped for commercial uses. The U.S. has historically dominated the global small-wind market but has faced pressure in recent years from overseas nations that have implemented strong domestic incentive programs for small-scale renewables. The U.S. small wind industry projects that the enactment of this federal credit, combined with a forthcoming equipment certification program, will help secure the U.S. market as the global leader.